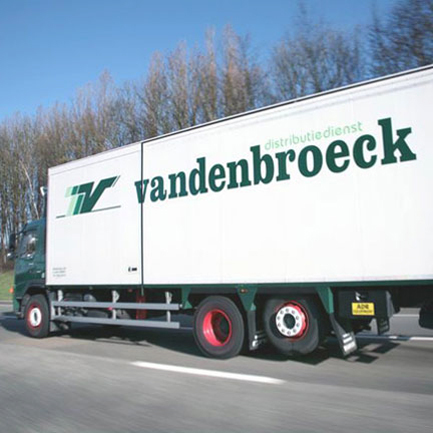 Vandenbroeck bvba is the ideal partner for the national and international haulage, distribution and goods storage. With a fleet of 50 trucks and a storage area capacity of 10,000m², we are able to offer you a range of services tailored to your company requirements. Vandenbroeck bvba's specific areas of expertise also include the transport of hazardous goods and compliance with ADR regulations. Why opt for Vandenbroeck bvba? As a customer, you expect your logistics partner to provide a service that is top-quality and extremely flexible. This also forms the heart of out business philosophy. Companies from a wide range of industries, including market leaders in chemicals FMCG (Fast Moving Consumer Goods), appreciate our logistics expertise on a daily basis, which is supplemented by our constant quest for innovation. This guarantees that Vandenbroeck bvba is not only able to provide the best possible service today, but will continue to do so into the future. We also devote our full attention to caring for the environment. Our Green Drive programme is designed to reduce our CO2 emissions: our fleet is equipped with EURO 4 and EURO 5 engines, while our drivers are trained to drive their trucks in an economical and environmentally-friendly way.